Weeks into the Parliament v. President v. Rafsanjani crisis over control of Islamic Azad University, there is no resolution. There have been efforts to play down the immediate conflict, for example, with the denial of Yasr Rafsanjani, the son of Hashemi Rafsanjani, that the university’s office manager was arrested (but not, the sharp-eyed will notice, a denial that a raid took place on the university’s offices). Yasr Rafsanjani also said that Azad University has written to head of judiciary, Sadegh Larijani, for “clarification”. The meeting of the “proper” (i.e., Government-controlled) university board, appointed by Supreme Council of the Cultural Revolution, has been postponed because of “issues”. No rescheduled date has been announced, so a takeover by the SCCR of the university seems to have been put off for now. Yet while there is no immediate showdown, the significance of the dispute continues to spread within the regime. We have had the anti-Majlis demonstrations, with the slogans against members of Parliament, who are overwhelmingly “principalist”, and against Speaker of Parliament Ali Larijani, who is from the key city of Qom. [Note: since Mr Verde wrote this, the news has come out of Ahmadinejad supporters disseminating anti-Larijani leaflets after Friday Prayers in Qom. We had the clash between principalist MPs Kouchakzadeh and Motahari with jibes, insults, and physical confrontation. We had a principalist MP make a speech in the Parliament asking, “Why is it that when some people (meaning Mir Hossein Mousavi and Mehdi Karroubi) want to demonstrate, they have to get a permit which is denied, but when others (meaning the pro-government mob) demonstrate without a permit and insult the Majlis, they are taken around in buses and provided lunch, cakes, and drinks? 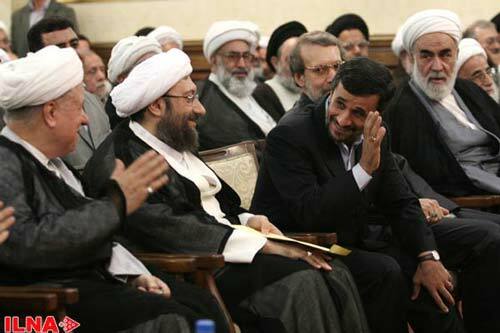 The Azad University arguments are also having effect on the dynamic between Ahmadinejad and the key party Motalefeh. As you reported, pro-Ahmadinejad MPs want to out the chairman of the Majlis education committee who is a member of Motalefeh (and incidentally is the brother-in-law of Azad University chancellor Jasbi). And now we have an interview with the chairman of Motalefeh, Mohammad-Nabi Habibi: he says that if events like 14 Khordad (the 4 June humiliation of Ayatollah Khomeini’s grandson), the SCCR decision on Azad University, the President’s letter to Council of Guardians and the Prosecutor General’s overruling of the decision of a court (the overturning of the injunction against the SCCR decision on Azad University) are repeated, it would harm the unity of even the followers of the Revolution. So now we have more than an argument; we have a crisis, escalating over the last four week. Habibi had no intention of condemning the heckling of Seyed Hassan Khomeini at the 4 June ceremony for his grandfather, but the Azad University episode has forced the hand of this most principalist of Iranian parties, Motalefeh.